Your big day rolls around only once a year, and you want to celebrate it in style. You’ve outgrown the novelty of doing shots at the local dive bar, but life’s too short to just sit this one out. 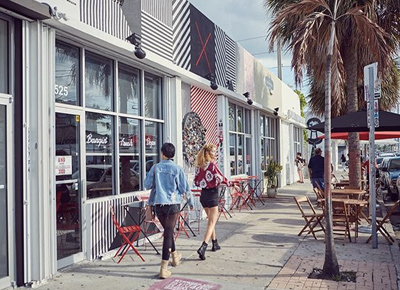 So we’ve rounded up nine places in Miami to mark the festive occasion. And guess what? Not one of them is a club or bar (but one does involve bottomless wine). OK, we know you’re fabulous. So naturally, you deserve an equally swank soiree. Rent a boat through Boatsetter and bring the party to the bay. You’ll need to BYOB, but a captain to sail you around is part of the package. Just off North Miami Avenue, pizza spot Mister 01 hosts pie-tossing classes. You and your pals will gather in a private dining room for a lesson and, under expert guidance, learn how to toss pizza dough—while snacking on pizza and sipping complimentary wine and beer, of course. Sure, you could ring in your next birthday in a dark, candlelit bar—or you could sip a cold beer and cruise along the ocean at sunset aboard a 40-foot catamaran. Grab your best friends and head to The Biltmore for a private cooking class taught by one of the hotel’s lead chefs. You’ll pick a theme (Mexican, Asian, Italian or South Floridian) and craft a multi-course meal filled with sweet and savory items. (Think tuna sashimi, Bolognese fettuccine or Thai doughnuts, depending on what menu you choose.) And yes, you get to eat the results once you’re done. OK, we know you haven’t been bowling since your sixth-grade birthday party. But Basement, a hidden spot below the Miami Beach Edition, has traded pizza and smelly shoes for a swanky, neon-lit bowling experience you never knew existed. Oh, and did we mention there’s an equally stunning ice-skating rink next door? When you enter your thirties, you definitely need to stop doing a few things—like defaulting to a vodka cranberry every time you order a drink. Let the expert mixologists at the Regent Cocktail Club teach you a few of the classics, like the Sazerac, French 75 and old-fashioned, during a private class with a few friends. You love wine, and your birthday party merits lots of it. At Happy Wine in Coconut Grove, you can reserve a private room for a three-course Latin-inspired meal. But here’s the important part: It’s paired with an open bar, which means bottomless wines by the glass, sangria and a selection of craft beer. Count. Us. In. Regular birthday dinners are overrated. Get your meal and drinks served to you at CMX Brickell while you swoon over Jason Bateman and Rachel McAdams in a screening of Game Night.